Leyya, the dreamy alt-pop duo behind songs like “Superego” and “Butter” are back with a killer sophomore album. 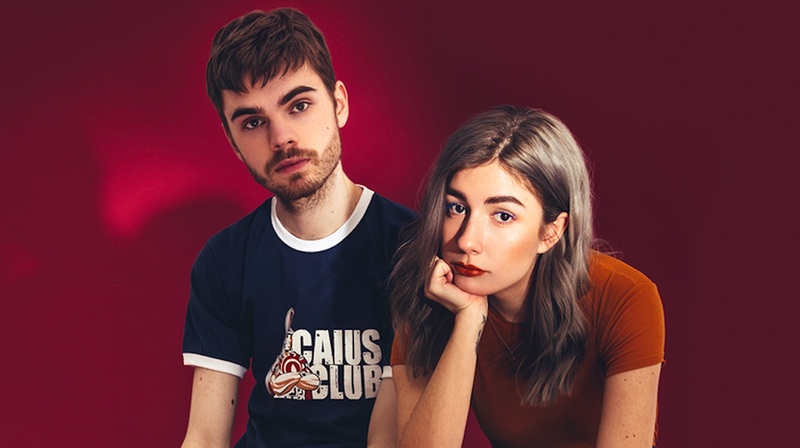 Sauna is experimental and ethereal, combining elements of pop, rock, and electronica to create 12 tracks brimming with angelic vocals and the synth/drum combos that dreams are made of. The band—Sophie Lindinger and Marco Kleebauer— created something entirely new with this release, as evidenced by standouts like “Drumsolo”, “Oh Wow”, and “Zoo”. The LP's title track, “Sauna” opens with a light drum rhythm, ambient noise, and a radio announcer discussing their accomplishments and labeling their sound as having a "very cool vibe". Bingo. The preamble is as calming as it is interesting, transitioning into a masterfully produced, multi-layered track 40 seconds in. There is self-awareness present in the lyrics that makes their songs all the more enchanting—the entire album is an exquisite collection of beautiful and honest poetry that take you on an auditory and sensory journey. 2018 is proving to be an exciting year for this brilliant two-piece. Next up on their agenda? SXSW. After wowing crowds in Austin, The Vienna natives will hit stages across Europe, festival hopping all spring and summer long. Ahead of their journey, they gave us the low-down on their all-time favorite venues across the pond. From Paradiso in Amsterdam to Budapest's A38, check out their picks below, then make sure to track them in Bandsintown to stay in-the-know about their future dates and festival appearances! "This venue has a very fun backstage. It's somewhere downstairs and it seems as if it is a labyrinth you never get out of again, so they have put colored lines on the floor for you to find your way. That's pretty funny." "It is very nice to be on stage and view three things at the same time: The skyline of Barcelona with the sun setting on the right side, the people in front of the stage and the ocean on the left side." "Once a year the public space in front of the Karls Church in Vienna is used for an Open Air Festival. They position the stage for the audience to look at the band playing with the white and green church lit up in the background." "It's a ship in Budapest with a stage built inside and the PA sounds really good. There's also a second venue on the ship which happens to be smaller, but the cool thing about it is the danube-view when you look outside the window while playing/watching a concert." "To be honest, we've actually never been inside the club, but we saw the damn entry. It's like in a star wars movie, a stairway to the underground in the middle of the Reeperbahn. They can close it so you don't even notice that there's something underneath."